The 2017 City market fire was a fire accident that occurred at a marketplace in Lusaka, the capital city of Zambia on 4 July 2017. It is estimated that property worth millions of kwacha was been destroyed in the fire. Initial reports indicate that no one was killed. This is the country’s biggest and busiest market and is one of the many public and private buildings to have been set ablaze in recent months. In early hours of Tuesday morning the Market was found engulfed in fire as shop owners cried helplessly while watching thier property being burn to ashes. It is unclear how the fire started and it is also unclear what time it started same report that the fire stared around 02:00 04:30 and also 05:20. While a police report reported that the fire started aroound 05:20 hours from one of the shops on the southern part of the market in the area called Dark yellow shops, an area where stationery and mobile phones are sold. The Lusaka City fire fighters were first on the ground trying to save the market. President Lungu state out that the perpetrators of these acts of arson, sabotage and vandalism are taking government and the law for granted and therefore government will not rest until these criminals are brought to book. He also stated out that the nation must remain calm and ensure no retaliatory action is taken to worsen the situation. 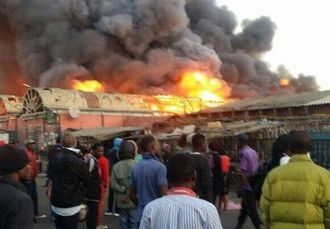 He also stated out that Zambians should remain patient as they await a full report by security services on the fire that has gutted city market. Vice President Inonge Wina also alleged that this was an act of sabotage she also stated out that there will be no mercy to the perpetrators of the crime once they are caught. Patrick Kangwa Disaster Management Unit (DMMU) National Coordinator reported that investigations are underway to establish the cause and extent of damage of the fire. The UPND party issued a statement in which they called out the Zambia Police forensics specialists and th Fire Department to take a proffessional and thorough look as to what could have caused this unfortunate incident. The statement also stated out that those that find comfort in politicizing such tragedies to lay off their hands and let independent proffessionals do their job unhindered. On 5 July President Lungu declared a State of Emergency by invoking Article 31 of the Zambian constitution. In his speech he stated out that there is no doubt perpetrators of this act is to make the country ungovernable. As president, he will not tolerate this lawslessness, he also pointed out that it was not an easy decision to make but was left with no choice as the primary responsibility is to protect life and property. On 11 July 2017, the committee of ministers appointed by President Lungu to look into the rebuilding of Lusaka City Market resolved that the trading place would be rebuilt in six weeks. The reconstruction would be led by the Zambia National Service (ZNS) in collaboration with the Lusaka City Council (LCC), and the business community. On 4 July 2017, the Lusaka City Market fire was gutted by fire and property worth millions of Kwacha was destroyed. This page was last edited on 21 January 2018, at 10:57.